Iran's President Hassan Rouhani addresses the nation in a televised speech after the closure of Iran's nuclear probe at the IAEA meeting, at his office in Tehran, Iran, Dec. 16, 2015. Iranian President Hassan Rouhani said he expects sanctions on Iran to be lifted in the coming weeks, after the U.N. nuclear agency ended its probe into allegations Iran once worked to develop nuclear weapons. Rouhani said in a televised address Wednesday the sanctions will end soon, after implementation in the "next week or two" of the historic nuclear agreement between Iran and six world powers. 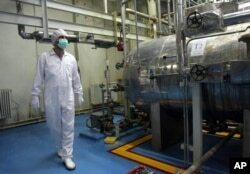 On Tuesday, the International Atomic Energy Agency unanimously approved a resolution to close its more than decade-old investigation into Iran's nuclear work. But on the same day, United Nations experts concluded that Iran violated a U.N. resolution when it fired a ballistic missile in October, a move that could lead to sanctions. FILE - An Iranian technician walks through the Uranium Conversion Facility just outside the city of Isfahan, south of the capital Tehran. A U.N. resolution prohibits Iran from launching ballistic missiles capable of delivering nuclear weapons. At the time of the launch, Iran Foreign Minister Mohammad Javad Zarif denied the missile was capable of carrying a nuclear warhead. In July, Iran reached a landmark agreement with the United States, Britain, China, France, Russia and Germany to curb its nuclear activity in exchange for much-needed sanctions relief. Part of that deal called for the IAEA to end its investigation and certify Iran's cooperation, before the sanctions placed on Iran because of its alleged nuclear activity will be lifted. Iran has long insisted its nuclear program is for peaceful purposes and not directed at creating weapons.